Zayed, M. Z., Wu, A., and Sallam, S. (2019). "Comparative phytochemical constituents of Leucaena leucocephala (Lam.) leaves, fruits, stem barks, and wood branches grown in Egypt using GC-MS method coupled with multivariate statistical approaches," BioRes. 14(1), 996-1013. This work, for the first time, identified the phytochemical constituents of leaves, fruits, stem barks, and wood branches extracted from the tree pruning wastes of Leucaena leucocephala (Lam.) de Wit. grown in Egypt, showing 49, 29, 34, and 27 phytocomponents, respectively, as assayed by gas chromatograph-mass spectroscopy (GC-MS) analysis. The major components of leaves were 1,2-benzenedicarboxylic acid, mono(2-ethylhexyl) ester (17.7%), betulin (15.7%), lupeol (14.7%), androstan-17-one,3-ethyl-3-hydroxy-, (5à)- (12.3%), 9,12,15-octadecatrienoic acid, methyl ester, (Z,Z,Z)- (11.6%), betamethasone (9.7%), and β-sitosterol (9.1%). The major phytocomponents of fruits were β-sitosterol (55.7%), 3beta-hydroxy-5-cholen-24-oic acid (48.7%), 1,2-benzenedicarboxylic acid, mono(2-ethylhexyl) ester (42.9%), lupeol (29.3%), betulin (15.8%), stigmasterol (12.8%), and campesterol (7.6%). The major phytocomponents of stem barks were 1,2-benzenedicarboxylic acid, diisooctyl ester (65.7%), β-sitosterol (27.2%), betulin (22.1%), lupeol (21.1%), and 9,12-octadecadienoic acid (Z,Z)-, methyl ester (8.8%). Wood branches contained β-sitosterol (60.1%), 1,2-benzenedicarboxylic acid, mono(2-ethylhexyl) ester (47.2%), lupeol (22.5%), campesterol (15.6%), and stigmasterol (14.1%). Most of the identified compounds have been reported to possess important biological activities, such as antimicrobial, anti-inflammatory, anticancer, anti-arthritic, antioxidant, and antidiabetic activities. The four constituents of L. leucocephala were statistically independent in these phytocomponents. The phytocomponents in five solvents were mixed in describing the four constituents. These constituents of L. leucocephala are potential bioresources for phytopharmaceutics. Leucaena leucocephala (Lam.) de Wit. (Leguminosae), formerly known as L. glauca and leuceana as a local name in Egypt (Orwa et al. 2009), is a miracle tree or shrub due to its worldwide success as a long-lived, highly nutritious forage tree (Brewbaker and Sorensson 1990), as well as its medicinal efficacy and multipurpose nature (Abdelhady and Abdallah 2016). It is native to southern Mexico and northern Central America, but it is now naturalized throughout all continents of the world (Holm et al.1979). It is a multipurpose tree or shrub used to produce firewood, timber, human food, green manure, and shade, as well as to control erosion (Brewbaker et al. 1972). It is one of the medicinal plants used in traditional medicine to control stomachache, and as a contraceptive and abortifacient agent (Zayed and Samling 2016). Various secondary metabolites have been identified from L. leucocephala using phytochemistry approaches, such as alkaloid, cardiac glycosides, tannins, flavonoids, saponins, and glycosides (Awe et al. 2013). The chemical constituents of the leaves of L. leucocephala from Malaysia are tetratetracontane, oxalic acid, allyl hexadecyl ester, squalene, octacosane, hexatriacontane, 5-octadecene, 1-octadecyne, 3,7,11,15-tetramethyl-2-hexadecen-1-ol, pentadecanoic acid, 14-methyl-, methyl ester, 9,12-octadecadienoic acid, methyl ester, hexadecanoic acid, 15-methyl-, methyl ester, 9,12,15-octadecatrienoic acid, methyl ester, 3,7,11-tridecatrienenitrile, 4,8,12-trimethyl, 2-dodecene, 7-hexadecene, 5-eicosene, 1-docosene, heptacosanoic acid, methyl ester, n-hexadecanoic acid, and phytol (Zayed and Samling 2016). The chemical composition of the leaf extracts of the same plant from Mexico were 2(H)-benzofuranone-5,6,7,7a-tetrahydro-4,4,7a-trimethyl, pentadec-anoic acid-14-methyl-methyl ester, and 6,10,14-trimethyl-2-pentadecanone, a ketone (Salem et al. 2011), whereas the principal chemical constituents of the whole plant extracts of L. leucocephala from China were ficaprenol-11 (polyprenol), squalene, lupeol,-sitostenone, trans-coumaric acid, cis-coumaric acid, pheophytin-a, pheophorbide, a methyl ester, methyl-132-hydroxy-(132-S)-pheophorbide-b, and aristophyll-C (Chen and Wang 2010). Medicinally, L. leucocephala has various biological effects such as antimicrobial, anthelmintic, antibacterial, anti-proliferative, antidiabetic, anticancer, cancer preventive, diuretic, anti-inflammatory, antioxidant, antitumor, antihistaminic, nematicide, pesticide, antiandrogenic, hypocholesterolemic, and hepatoprotective activities (Meena Devi et al. 2013; Zayed and Samling 2016). Almost the whole plant of the L. leucocephala species has been consumed as human food and traditional medicine since the era of the Mayans (Brewbaker et al. 1972; Zayed and Samling 2016). In Indonesia, Thailand, and Central America, people eat the young leaves, flowers, and young pods as an ingredient for soups and salads. In the Philippines, the young pods are cooked as a vegetable, and roasted seeds are used as a substitute for coffee or popped like popcorn (Rushkin 1984; Zayed and Samling 2016). Seeds are considered as non-conventional sources of protein together with other leguminous seeds (Rushkin 1984; Zayed and Samling 2016). The bark is eaten for internal pain. A decoction of the root and bark is taken as a contraceptive and depilatory in Latin America (Duke 1983). Different pharmacological properties of L. leucocephala have been reported. However, the phytochemical constituents remain unknown. Therefore, this is the first phytochemical study using GC-MS analysis of these four constituents from L. leucocephala to investigate and compare these four constituents grown in Egypt, using gas chromatography-mass spectrometry (GC-MS). Fresh leaves, fruits, stem barks, and wood branches from the tree pruning wastes of Leucaena leucocephala (Lam.) de Wit were collected from the nursery of Forestry and Wood Technology Department, Faculty of Agriculture, Alexandria University, Egypt in the middle of September 2016, and the laboratory work was completed at the end of October 2017. The plant materials were taxonomically identified and confirmed by Prof. Dr. Ahmed A. El-Settawy, Head of Forestry and Wood Technology Department, Faculty of Agriculture (El-Shatby), Alexandria University, Alexandria, Egypt. The samples were dried in the shade in open-air conditions for 6 to 12 days prior to extraction and ground to a powder with an electric blender. A total of 100 g of air-dried powder of the leaves, fruits, stem barks, and wood branches of L. leucocephala were used for the extraction with each of the following solvents with increasing polarities: hexane, petroleum ether, chloroform, ethyl acetate, and methanol. Approximately 250 mL of each solvent was poured in a 500-mL conical flask that held the air-dried leaves, fruits, stem barks, and wood branches. The flask was closed with a cotton wool plug and wrapped with aluminum foil. The extraction was continued for 72 h under laboratory conditions. The residue was extracted two more times using the same method to ensure complete extraction. The residue was discarded, and the filtrates were combined. The extracts were filtered using Whatman No. 1 filter paper along with 2 g sodium sulfate that was wetted with 95% ethanol to remove any sediments and traces of water in the filtrate. The solvents were evaporated to dryness using a rotary evaporator. All steps were performed three times in order to increase the effectiveness of the extraction process. All extracts were kept dry in sealed white vials and stored at 4 °C until they were used for GC-MS analysis. GC-MS analysis of the chemical composition of hexane, petroleum ether, chloroform, ethyl acetate, and methanol extracts of L. leucocephala leaves, fruits, stem barks, and wood branches grown in Egypt were performed on a GC-MS device Thermo Scientific Trace GC1300-TSQ 8000 evo equipped with TG-5MS (Waltham, MA, USA); the carrier gas was He with a flow of 1 mL/min. The GC-MS system contained a DB-5 cross-linked column (30 m long x 0.25 mm ID x 0.25 μm film thickness composed of 5% phenyl methyl polysiloxane). The initial temperature was programmed at 50 °C and held for 2 min, and then it was increased to 300 °C at the rate of 6.5 °C/min. The final temperature was held for 10 min. The temperature of the injector and detector were 280 °C and 300 °C, respectively. Next, 1 μL of the fractions was diluted in 100 μL hexane and then injected into the GC-MS (Trabalon et al. 2005; Alagammal et al. 2012). Spectral data were interpreted using the National Institute Standard and Technology (NIST) database (https://www.nist.gov/). The name, molecular mass, and structure of the components of the test materials were ascertained. Principal component analysis (PCA) based on correlation matrix was performed to elucidate the correlated phytochemical composition in leaves, fruits, stem barks, and wood branches of L. leucocephala. The results were further analyzed by multivariate statistical approach employing a hierarchical cluster analysis (HCA, Pvclust function in R) associated with proximity score matrix represented as proximity heat-map. The components present in the hexane, petroleum ether, chloroform, ethyl acetate, and methanol extracts of the four constituents in L. leucocephala were identified by GC-MS (Supplementary Figs. 1 to 4). 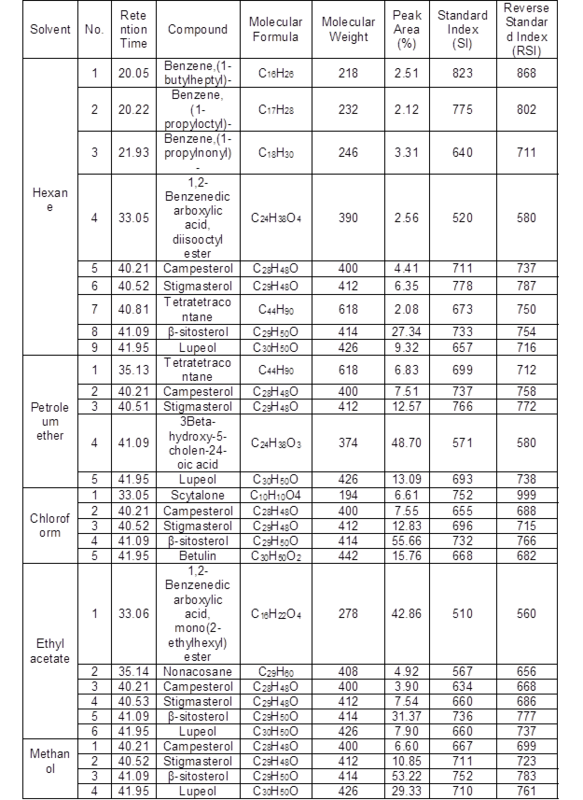 The active principles with their retention time (RT), molecular formula, molecular weight (MW), peak area in percentage, standard index (SI), and reverse standard index (RSI) are presented and the identified compounds are enlisted in Tables 1 through 4. 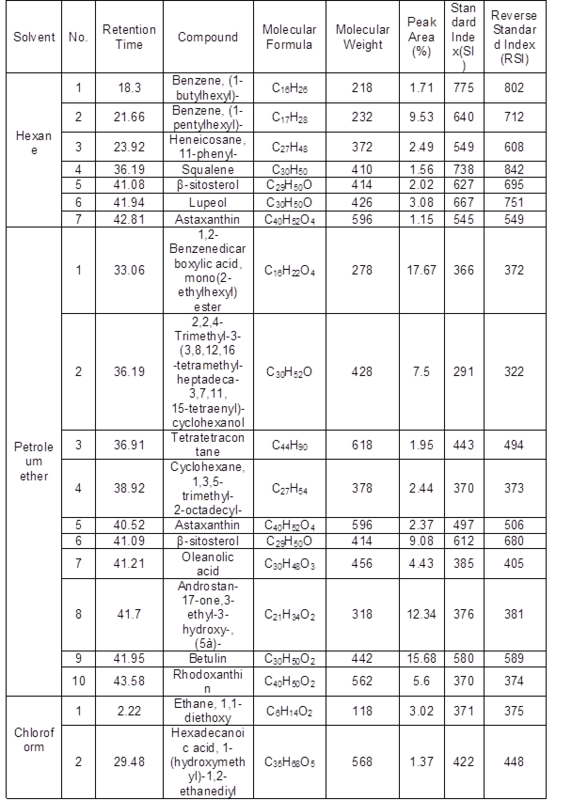 The phytochemical constituents of L. leucocephala leaves from Egypt identified from five solvent extracts after comparison of the mass spectra with NIST library (Table 1) were 49 phytocomponents, and the major components were 1,2-benzenedicarboxylic acid, mono(2-ethylhexyl) ester (17.7%), betulin (15.7%), lupeol (14.7%), androstan-17-one,3-ethyl-3-hydroxy-, (5à)- (12.3%), 9,12,15-octadecatrienoic acid, methyl ester, (Z,Z,Z)- (11.6%), betamethasone (9.7%), and β-sitosterol (9.1). These findings were in accordance with results in other studies on the same species and other species such as 1,2-benzenedicarboxylic acid, mono(2-ethylhexyl) ester, which was identified as the major compound of petroleum ether extract of L. leucocephala leaves, and was also reported as the major compound of Andrographis paniculata (Krishnamoorthy and Kalaiselvan 2016) and Gracilaria dura (Cyriac and Eswaran 2015) leaf extracts. Squalene, phytol, 9,12,15-octadecatrienoic acid, methyl ester, (Z,Z,Z)-, n-hexadecanoic acid, and tetratetracontane have been reported in the leaf extract of the same species from Malaysia (Zayed and Samling 2016). Betulin, lupeol, androstan-17-one,3-ethyl-3-hydroxy-, (5à)- and 9,12,15-octadecatrienoic acid, methyl ester, (Z,Z,Z)- were detected as the major compounds of L. leucocephala leaves, which were also reported as the major compounds of Orthosiphon stamineus (Hossain and Ismail 2013), Broussonetia luzonica (Casuga et al. 2016), Andrographis paniculata (Kalaivani et al. 2012), and L. leucocephala (Zayed and Samling 2016) leaf extracts, respectively. Approximately 29 phytochemical compounds were identified in the fruits of L. leucocephala using five different solvents (Supplementary Fig. 2) (Table 2). GC-MS analysis of fruit extracts of L. leucocephala revealed that the major compounds were β-sitosterol (55.7%), 3beta-hydroxy-5-cholen-24-oic acid (48.7%), 1,2-benzenedicarboxylic acid, mono(2-ethylhexyl) ester (42.9%), lupeol (29.3%), betulin (15.8%), stigmasterol (12.8%), and campesterol (7.6%). There was no previous report on the phytochemical screening of hexane, petroleum ether, chloroform, ethyl acetate, and methanol extracts of L. leucocephala fruit by GC-MS. The major compounds were also reported elsewhere in different species, such as β-sitosterol in Triphaladi rasayana (Muthiah et al. 2017), 3beta-hydroxy-5-cholen-24-oic acid in Moringa oleifera (Agboke and Attama 2016), 1,2-benzenedicarboxylic acid, mono(2-ethylhexyl) ester in Andrographis paniculatas (Hossain and Ismail 2013), lupeol in Albizia adianthifolia (Abubakar and Majinda 2016), betulin in Orthosiphon stamineus (Cyriac and Eswaran 2015), stigmasterol in Albizia adianthifolia (Abubakar and Majinda 2016), and campesterol in Moringa oleifera (Agboke and Attama 2016). These major compounds had important biological activities for medical application. β-sitosterol is known to reduce cholesterol and control benign prostrate hypertrophy as well as inflammation (Saleem 2009). Lupeol has anti-inflammatory and anti-cancer activities (Geetha and Varalakshmi 2001). Betulin has anticancer and apoptosis activities (Patočka 2003). Stigmasterol has thyroid inhibitory, antiperoxidative, and hypoglycemic effects (Panda et al. 2009). Campesterol is known to have cholesterol-lowering and anticarcinogenic effects (Choi et al. 2007). In the GC-MS analysis, 34 bioactive phytochemical compounds were identified in the five different solvents: hexane, petroleum ether, chloroform, ethyl acetate, and methanol extracts in the bark of L. leucocephala (Supplementary Fig. 3). The identification of phytochemical compounds was based on the peak area, molecular weight, molecular formula, standard index (SI), and reverse standard index (RSI). The identified high peak area (1,2-benzenedicarboxylic acid, diisooctyl ester) (C24H38O4) with RT 33.05 had a peak area of 65.7%, β-sitosterol (C29H50O) with RT 41.1 had a peak area of 27.2%, betulin (C30H50O2) with RT 42.0 had a peak area of 22.1%, lupeol (C30H50O) with RT 41.9 had a peak area of 21.1%, and 9,12-octadecadienoic acid (Z,Z)-, methyl ester (C19H34O2) with RT 27.22 had a peak area of 8.8%. The results are presented in Table 3. Similar compounds were found in stem bark extracts: 1,2-benzenedicarboxylic acid, diisooctyl ester, lupeol, and 9,12-octadecadienoic acid (Z,Z)-, methyl ester were observed in the bark of Pterocarpus marsupium (Maruthupandian and Mohan 2011). 1,2-Benzenedicarboxylic acid, diisooctyl ester was detected as one of the major compounds in the bark of Pleiospermium alatum (Parthipan et al.2015). 1,2-Benzenedicarboxylic acid, diisooctyl ester (48.8%) was found to be a major component followed by 9,12-octadecadienoic acid (Z,Z) in Hugonia mystax L. (Rajeswari et al. 2012). 1,2-Benzenedicarboxylic acid, diisooctyl ester and stegmasterol were detected in stem bark of Kirganelia reticulate (Reddy et al. 2017). Lupeol and 9,12-octadecadienoic acid (Z,Z)-, methyl ester were found in the bark of Zanthoxylum rhetsa (Santhanam et al. 2016). Lupeol and betulin were observed in the bark of Alnus glutinosa L. (Felföldi-Gáva et al. 2012). β-sitosterol, stigmasterol, and lupeol were found in the aerial parts of Kirganelia reticulate (Mohan et al.2013). β-sitosterol, stigmasterol, and 9,12-octadecadienoic acid (Z,Z)- were identified in the bark of Dolichandrone atrovirens (Deepa and Murugesh 2013). GC-MS analysis of hexane, petroleum ether, chloroform, ethyl acetate, and methanol extracts of L. leucocephala wood branches were presented in Supplementary Fig. 4 and Table 4. There were 27 compounds revealed in the hexane, petroleum ether, chloroform, ethyl acetate and, methanol extracts of L. leucocephala wood branches with the presence of β-sitosterol (60.1%), 1,2-benzenedicarboxylic acid, mono(2-ethylhexyl) ester (47.2%), lupeol (22.5%), campesterol (15.6%), and stigmasterol (14.1%) (Table 4). This was the first study for the chemical composition of wood branches of L. leucocephala from Egypt. The major compounds of the hexane, petroleum ether, chloroform, ethyl acetate, and methanol extracts of wood branches of L. leucocephala were β-sitosterol, 1,2-benzenedicarboxylic acid, mono(2-ethylhexyl) ester, lupeol, campesterol, and stigmasterol. These major compounds were also found in species other than L. leucocephala such as Dolichandrone atrovirens (Deepa and Murugesh 2013), Pleiospermium alatum (Parthipan et al. 2015), Dolichandrone atrovirens (Deepa and Murugesh 2013), Robinia pseudoacacia (Hosseinihashemi and Kanani 2012), and Kirganelia reticulate (Mohan et al. 2013), respectively. In Robinia pseudoacacia heartwood extracts also were found to be 13.8% stigmasterol, 6.1% hexadecanoic acid, and 3.5% campesterol (Hosseinihashemi and Kanani 2012). Stigmasterol was one of the major compounds of Albizia adianthifolia heartwood extracts (Abubakar and Majinda 2016). Stigmasterol and campesterol were isolated from wood extracts of Zanthoxylum quinduense (Patiño Ladino and Cuca Suárez 2010). Multivariate statistical analysis revealed interconnected correlation patterns among the phytochemical components of the four constituents of L. leucocephala (Fig. 1). Fig. 1. Multivariate statistical analysis of the phytochemical constituents of leaves, fruits, stem barks and wood branches. (a) Principal component analysis (PCA) of four traits (leaves, fruits, stem barks, and wood branches) in L. leucocephala. A PCA was based on the correlation matrix of phytochemical composition. The first and second principal components accounted for 53.1% and 25.8% of variation, respectively; (b) A consensus tree of the relationships among leaves, fruits, stem barks, and wood branches in L. leucocephala. 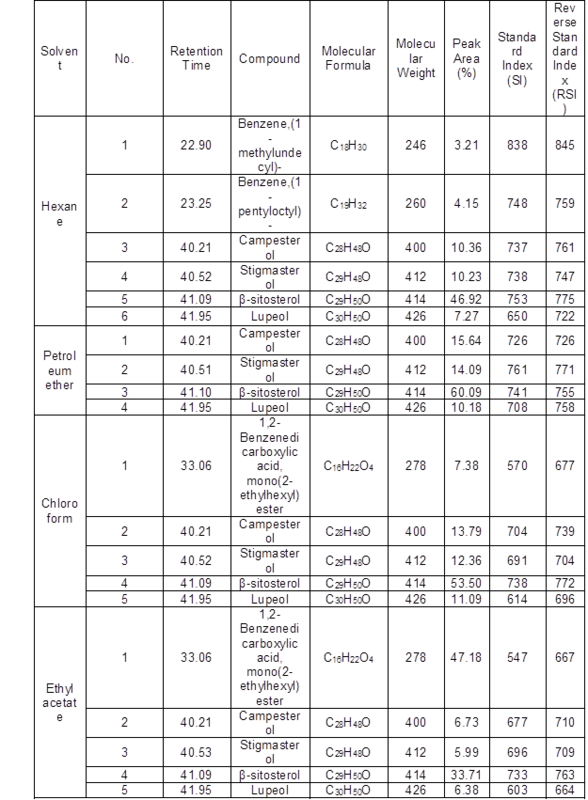 Pvclust package in R was used to cluster these traits according to the Euclidean distance matrix. The numbers at the forks were the percentages of approximately unbiased (AU; in red) p-values and bootstrap probabilities (BP, in green) estimated from 1000 bootstrapping samples; (c) A heatmap showing cluster groups in both phytochemical composition and different traits of L. leucocephala (leaves, fruits, stem barks, and wood branches). Symbols “L” stands for leaves, “F” stands for fruits, “SB” stands for stem barks, and “WB” stands for wood branches. The numbers on the right side represent the codes for 77 phytochemical components within five solvents that showed a mixed pattern. Partial convergence of phytochemical composition resulted due to synonymous primary and secondary metabolic pathways, which gave rise to identification of common phytochemicals or their derivatives in multiple parts of the plant. For instance, several compounds were identified in multiple parts of L. leucocephala, such as representing common or overlapping metabolic pathways. Spatial arrangement of the phytochemical composition in the four traits of L. leucocephala in the double-positive quadrant signified the presence of interrelated phytochemical composition (Fig. 1a). The loading plot of principal components 1 and 2 accounted for 53.1% and 25.8% of variance, respectively. Moreover, clustering of phytochemical composition exhibited a mixed pattern in describing the variation of the four traits of L. leucocephala. Furthermore, the presence of fairly distinct phytochemical composition in the leaves and other parts of L. leucocephala was highlighted by their isolated spatial location in the component plot as well as the correlation matrix (Table 5). It was interesting that the clustering analysis using a hierarchical method (Fig. 1b) showed a concordant pattern with PCA analysis. Phytochemical composition of the traits of L. leucocephala were grouped into various clusters according to their proximities. 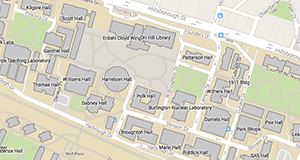 The proximity heat map (Fig. 1c) corroborated the correlation matrix demonstrating similar phytochemical composition in the four traits of L. leucocephala. From the GC-MS analysis of all solvent extracts of L. leucocephala leaves, fruits, stem bark, and wood branches, 49, 29, 34, and 27 phytocomponents were identified from leaves, fruits, stem bark, and wood branch extracts, respectively. 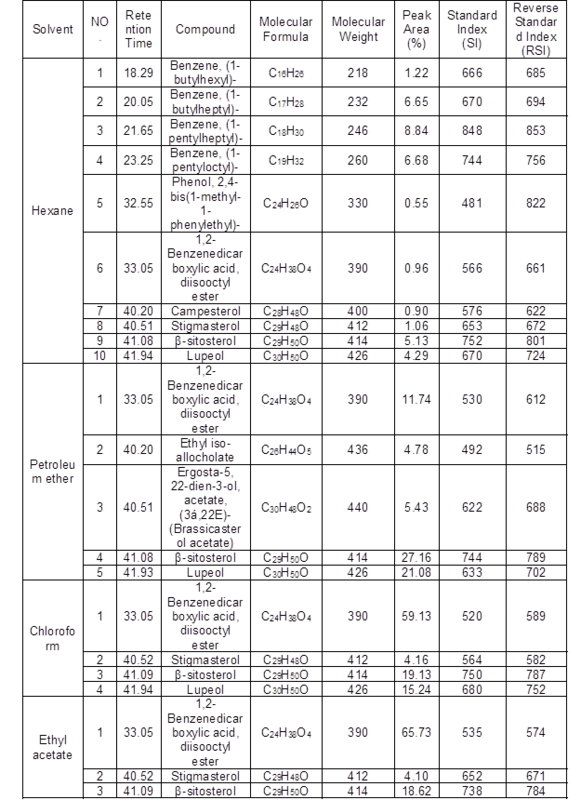 Some of the identified compounds contribute to various biological effects such as anti-microbial, anti-cancer, antimutagenic, antipeptic, antiseptic, antispasmodic, antiadrenogenic, and hypocholester-olemic activities, as summarized in Table 6 (Duke 2007). Plasticizer compounds such as 1,2-benzenedicarboxylic acid, mono(2-ethylhexyl) ester and 1,2-benzenedicarboxylic acid, diisooctyl ester have been found as one of the major compounds in the four trait extracts of L. leucocephala. β-sitosterol, lupeol, and betulin were also identified as the major compounds of these four trait extracts of L. leucocephala. Stigmasterol and campesterol were present in fruits, stem barks, and wood branch extracts of L. leucocephala. Phytol and squalene have been shown in leaf extracts of L. leucocephala. Vitamin E was found in the leaves and stem bark extracts of L. leucocephala. Hexadecanoic acid, methyl ester, n-hexadecanoic acid, and 9,12,15-octadecatrienoic acid, methyl ester, (Z,Z,Z) were also found in the leaves, stem bark, and wood branch extracts of L. leucocephala. The founding compounds from the GC-MS analysis of all solvent extracts of the four constituents of L. leucocephala had important biological activities for medical applications, such as plasticizer compounds that were reported to have antifouling and antimicrobial activities (Sermakkani and Thangapandian 2012). β-sitosterol has the properties of anticancer, antimicrobial, antiasthma, diuretic, antiarthritic, and anti-inflammatory (Mohan et al. 2013). Lupeol is one of the triterpenoids that is used as anti-inflammatory activity (Saleem 2009) and anti-cancer (Geetha and Varalakshmi 2001). Betulin has been reported to have antimalarial, anticancer, anti-HIV, anthelmintic, anti-bacterial, antimicrobial, and antifeedant activities (Moghaddam et al. 2012). Stigmasterol has several pharmacological prospects such as antiosteoarthritic, antihypercholestrolemic, antitumor, hypoglycaemic, antimutagenic, antioxidant, anti-inflammatory, and CNS effects (Marquis et al. 1977; Jeon et al. 2005). Campesterol and stigmasterol are the most commonly occurring phytosterols in the human diet; each contribute about 30% and 3% of diet contents, respectively (Weihrauch and Gardner 1978; Harcombe and Baker 2014). Campesterol has been reported to have cholesterol-lowering and anticarcinogenic effects (Kelly 1999). 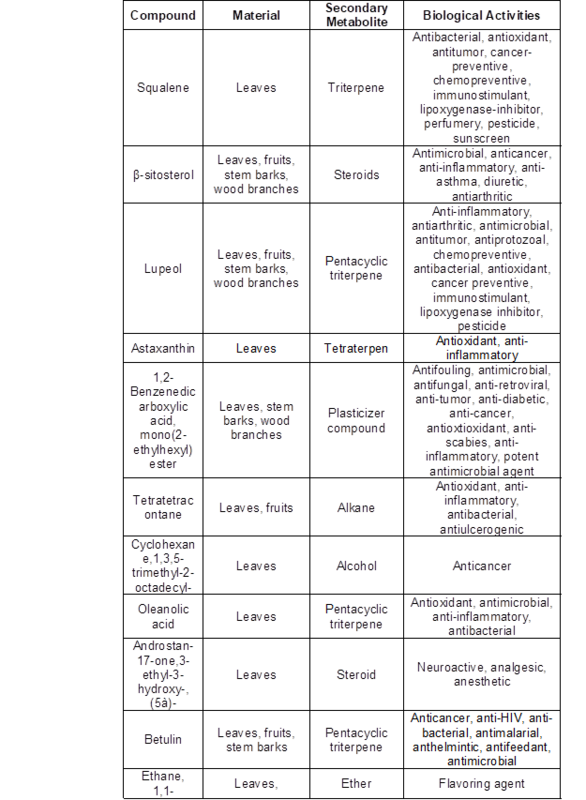 The diterpene phytol had anticancer, diuretic, antimicrobial, cancer preventive, and anti-inflammatory activities (Sermakkani and Thangapandian 2012). In the present study, the leaves, fruits, stem barks, and wood branches supplied from the tree pruning wastes of L. leucocephala contained many important phytochemical components. The GC-MS analysis of hexane, petroleum ether, chloroform, ethyl acetate, and methanol extracts of these four constituents of L. leucocephala showed the presence of 49, 29, 34, and 27 phytocomponents, respectively. Plasticizer compounds, β-sitosterol, lupeol, and betulin were identified as the major compounds of four constituents extracts of L. leucocephala. Stigmasterol and campesterol were present in fruits, stem barks, and wood branch extracts. Phytol and squalene have been shown in leaf extracts. Vitamin E was found in the leaves and stem bark extracts. Hexadecanoic acid, methyl este, n-hexadecanoic acid, and 9,12,15-octadecatrienoic acid, methyl ester, (Z,Z,Z) were also found in these four constituents extracts of L. leucocephala. Among the identified compounds, 24, 10, 14, and 8 compounds were from leaves, fruits, stem barks and wood branches extracts of L. leucocephala, respectively. These compounds have been reported to possess various biological activities such as antifungal, antimicrobial, antitumor, antidiabetic, anticancer, antioxidant, antiscabies, anti-inflammatory, thyroid inhibitory, antiperoxidative, antimicrobic, hypoglycemic, anticancer, diuretic, antiarthritic, antiasthma, antitetany, and antianemia, etc. The presence of various bioactive compounds justified the use of the leaves, fruits, stem barks, and wood branches of L. leucocephala for various ailments by traditional practitioners. Therefore, the authors recommend using the leaves, fruits, stem barks and, wood branches of L. leucocephala as bioresources of phytopharmaceutical importance. However, further studies need to be undertaken to fully ascertain its bioactivity. This work was supported by Open Fund of State Key Laboratory of Tree Genetics and Breeding (Beijing) (Grant Number TGB2015007), Guangdong Forestry Science and Technology Innovation Project (2017KJCX028), Asian and African countries outstanding young scientists Program, Science and Technology Development Fund (STDF), Ministry of Scientific Research under Grant No. 18575. The authors appreciate Prof. Xin-Sheng Hu for his helping in perform the Principal Component Analysis (PCA). Agboke, A. A., and Attama, A. A. (2016). “Bioactive components and antibacterial activities of n-hexane extract of Moringa oleifera root bark on clinical isolates of methicilin resistant Staphylococcus aureus,” Int. J. Curr. Res. Chem. Pharm. Sci. 3(3), 1-9. Alagammal, M., Tresina, P. S., and Mohan, V. R. (2012). “GC-MS determination of bioactive components of Polygala javana DC,” Int. J. Curr. Pharm. Res. 4(2), 42-44. Awe, F. A., Giwa-Ajeniya, A. O., Akinyemi, A. A., and Ezeri, G. N. O. (2013). “Phytochemical analysis of Acalypha wilkesiana, Leucaena leucocephala, Pepperomia pellucida and Senna alata leaves,” Int. J. Eng. Sci. 2(9), 41-44. Brewbaker, J. L., Gonzalez, V., and Plucknett, D. L. (1972). “Varietal variation and yield trials of Leucaena leucocephala (koa haole) in Hawaii,” 166, 1-29. Brewbaker, J., and Sorensson, C. T. (1990). “New tree crops from interspecific Leucaena hybrids,” in: Advances in New Crops, J. Janick and J. E. Simon (eds. ), Timber Press, Portland, OR, pp. 283-289. Cyriac, B., and Eswaran, K. (2015). “GC-MS determination of bioactive components of Gracilaria dura (C. Agardh) J. Agardh,” Sci. Res. Report 5(2), 100-105. Deepa, P., and Murugesh, S. (2013). “GC-MS determination of bioactive compounds of Dolichandrone atrovirens (Sprague) bark,” Int. J. Biol. Pharm. Allied Sci. 2, 1644-1657. Duke, J. A. (1983). “Handbook of energy crops: Leucaena leucocephala (Lam.) deWit,” Center for New Crops & Plant Products, (https://www.hort.purdue.edu/newcrop/duke_energy/Leucaena_leucocephala.html). Duke, J. A. (2007). “Phytochemical and ethnobotanical databases,” (https://phytochem.nal.usda.gov/phytochem/search). Geetha, T., and Varalakshmi, P. (2001). “Anti-inflammatory activity of lupeol and lupeol linoleate in rats,” J. Ethnopharmacol. 76(1), 77-80. Holm, L., Pancho, J. V., Herberger, J. P., and Plucknett, D. L. (1979). A Geographical Atlas of World Weeds, John Wiley and Sons, Hoboken, NJ, United States. Kalaivani, C. S., Sahaya Sathish, S., Janakiraman, N., and Johnson, M. (2012). “GC-MS studies on Andrographis paniculata (Burn.f.) Wall. ex Nees – A medicinally important plant,” Int. Med. Arom. Plants 2(1), 69-74. Kelly, G. S. (1999). “Squalene and its potential clinical uses,” Altern. Med.Rev. 4(1), 29-36. Krishnamoorthy, P., and Kalaiselvan, D. (2016). “Isolation of plasticizer compound 1,2-benzenedicarboxlyic acid in leaf extract of Andrographis paniculatas,” Int. J. Innov. Res. Sci. Eng. Technol. 5(4), 4985-4991. Maruthupandian, A., and Mohan, V. R. (2011). “GC-MS analysis of some bioactive constituents of Pterocarpus marsupium Roxb,” Int. J. Chemtech Res. 3(3), 1652-1657. Meena Devi, V. N., Ariharan, V. N., and Nagendra Prasad, P. (2013). “Nutritive value and potential uses of Leucaena leucocephala as biofuel–A mini review,” Res. J. Pharm. Biol. Chem. Sci. 4(1), 515-521. Mohan, V. R., Sudha, T., and Chidambarampillai, S. (2013). “GC-MS analysis of bioactive components of aerial parts of Kirganelia reticulata Poir (Euphorbiaceae),” J. Curr. Chem. Pharm. Sci. 3(2). Muthiah, M. L., Rao, M. R., Elizabeth, A. A., and Rahman, F. (2017). “GC-MS analysis of Triphaladi Rasayana, an Ayurvedic rejuvenant,”Int. J. Pharm. Sci. Rev. Res. 42(2), 236-238. Orwa, C., Mutua, A., Kindt, R., Jamnadass, R., and Simons, A. (2009). “Agroforestree database: A tree species reference and selection guide version 4.0,” World Agroforestry Centre ICRAF, Nairobi, KE. Parthipan, B., Suky, M. G. T., and Mohan, V. R. (2015). “GC-MS analysis of phytocomponents in Pleiospermium alatum (Wall. ex Wight and Arn.) Swingle, (Rutaceae),” J. Pharm. Phytochem. 4, 216-222. Patočka, J. (2003). “Biologically active pentacyclic triterpenes and their current medicine signification,” J. Appl. Biomed. 1, 7-12. Rajeswari, G., Murugan, M., and Mohan, V. R. (2012). “GC-MS analysis of bioactive components of Hugonia mystax L. (Linaceae),” Res. J. Pharm. Biol. Chem. Sci. 3(4), 301-308. Reddy, R. A., Krishna, V., Usha, S., Bharathi, R., and Murthy, V. K. (2017). “GC-MS analysis of methanolic extract of stem and root bark of Kirganelia reticulata for bioactive components,” Int. J. Fund. Appl. Sci. 6(2), 8-13. Rushkin, F. R. (ed.) (1984). Leucaena: Promising Forage and Tree Crops for the Tropics, National Research Council, National Academy Press, Washington, DC. Salem, A. Z. M., Salem, M. Z. M., González-Ronquillo, M., Camacho, L. M., and Cipriano, M. (2011). “Major chemical constituents of Leucaena leucocephala and Salix babylonica leaf extracts,” J. Trop. Agric. 49(1-2), 95-98. Sermakkani, M., and Thangapandian, V. (2012). “GC-MS analysis of Cassia italica leaf methanol extract,” Asian J. Pharm. Clin. Res. 5(2), 90-94. Weihrauch, J. L., and Gardner, J. M. (1978). “Sterol content of foods of plant origin,” J. Am. Diet. Assoc. 73(1), 39-47. Article submitted: March 16, 2018; Peer review completed: April 24, 2018; Revised version received: July 8, 2018; Revised version accepted: November 25, 2018; Published: December 12, 2018.